Ever bought a beauty product purely for its shade name? This isn't even out yet; not even on the Sephora site. 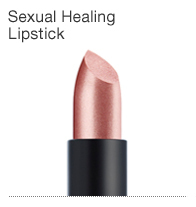 The name is just so eye-catching, otherwise...it would appear to be a frosted pink lipstick (even though the Nars site images seldom match the actual products). Not a shade I'd gravitate toward. Still...who's to say? The MAC Strawberry Blonde lipstick I've deemed a Grail was not a shade I'd be drawn toward, either, when I bought it. The Catherine Deneuve name was what caught my eye, made me try it out. For about a year I didn't wear it much at all, then I fell in love with it. I almost bought Sexual Healing sight unseen then realized that would be ridiculous, given I can just drive less than half an hour, when it does hit the stores, and see it for myself. I've already decided Nars is my next lipstick purchase, one way or another.